Hello, I'm back! After taking a breather following the 31-Day Challenge, I'm back and ready to roll :D I have a simple swatch today, but I'm planning to put some art over it, so I'll show you tomorrow! 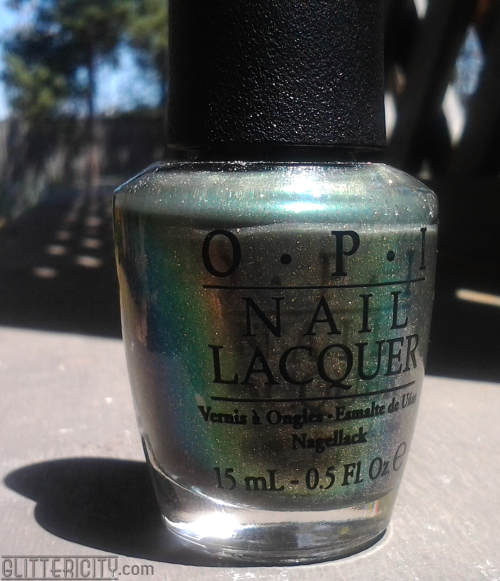 This polish is a pretty multichrome by OPI called Not Like The Movies. Here's a pretty bottle shot! The bottle shows a full spectrum of colours, but sadly all those did not transfer to the nail. I feel like it might be bolder when layered over black, so I'm going to try that next time! For this post though, I wanted to show it alone. It is a bit sheer, so I used four thin coats for these swatches. It's primarily a nice silvery grey, but leans rosy to mauve to lavender at some angles, and green to gold at others. What makes this really special is the tiny silver glittery flecks dispersed through it! I love this shot--it's so bright and shiny with the water droplets! It's crazy how different the color looks in different lights! I love it!